Following disappointing election results, United Russia is still enjoying vigorous support from pro-government youth groups that are staging rallies in the capital – while riot police are targeting the opposition, which alleges massive voter fraud. Pro-Kremlin youth groups have voiced their concerns over the possibility of unrest in the capital. By December 4, election day, Nashi had brought about 15,000 young people from some 20 regions to Moscow’s Forum of Civil Activists, held in the All-Russia Exhibition Center (VVTs) in order to “supervise the election process and maintain order on the streets.” The members who traveled to Moscow voted with absentee ballots. They held meetings and concerts on the Revolution and Manezhnaya Squares to show their devotion to President Dmitry Medvedev and Prime Minister Vladimir Putin. On December 6, Nashi and other pro-Kremlin youth groups stepped forward to support United Russia amid allegations of vote-rigging, first gathering on Manezhnaya and then walking to Triumfalnaya Square, a space traditionally used by opposition groups. 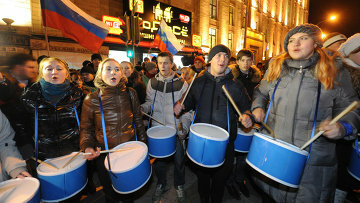 About 5,000 activists beat drums and chanted “Russia! Putin!” and “Russia! Medvedev!” to show their support for the government. Members of the media noted that the pro-Kremlin youth groups played the famous “Imperial March” tune – which is associated with the villainous Darth Vader. “We were playing the Imperial March from Star Wars to muffle the protesters, the purpose of this action was to show that the choice of millions of people should be respected and the opposition shouldn’t draw attention to itself and create a transport collapse,” said Oleg Sokolov, head of the pro- Kremlin Steel movement, which used to be part of Nashi. Some observers said that the pro- Kremlin youth groups appeared to enjoy preferential treatment from the police. Nashi, whose goals are promoting government, patriotism and anti-fascism, say that they want to protect rule of law and prevent an Orange Revolution scenario from happening in Russia. Another flash-mob by Nashi is planned for Constitution Day, on December 12. “We have people who can come to our rally after a single call from any part of Russia on a moment’s notice, so we can organize the meet-ups really fast,” said Sokolov, of the Steel movement. However, ideology and a commitment to United Russia’s cause may not the only incentive for the youth flowing into the Russian capital. Free trips to Moscow, excursions and concerts are said to be alluring to young Nashi members who live far away from the capital, in small towns. “Some of the members of Nashi are given hope that they will be included on United Russia’s deputy lists – but they are deceived by the heads of the movements, they just use them for their own purposes,” said Anatoly Turenko, the first secretary of Moscow City Department of Leninsky Komsomol, a youth division of the Communist party. The opposition has alleged that the pro-Kremlin youth rallies consisted mostly of people who came from the regions in order to take part in carousel voting – an illegal tactic that involves individuals traveling to various districts to cast multiple ballots. “All these 15,000 Nashi activists came from the regions with the absentee ballots not to instill order at the polls, but to take part in carousel voting, this is why United Russia got a high result in Moscow,” said Turenko. “It’s cynical of the authorities to get kids to break the law – and spoil their reputation and conscience from an early age,” Turenko added. The authorities have always been generous in supporting loyal youth organizations. Yet in April of this year, then-Finance Minister Alexei Kudrin refused funding for the ideological “Youth of Russia” program, proposed by Nashi leader Vasily Yakemenko as a means of promoting patriotism and innovation. “We spend a lot of money on other programs aimed at education, healthcare and sports activity of the youth, so when we are given a proposal for a 2 million ruble program we should realize that 70 percent of the expenditures already go to the young – we are watching out so that there is no duplication of effort,” Interfax quoted Kudrin as saying at the time. Read other articles of the print issue "The Moscow News #95"